The wind, hurrying across the marshes beneath the wide open sky, whispers gently in the reeds on either side of the road, and somewhere in the distance a buzzard is mewing. Smaller birds twitter. But Emmanuel isn’t talking about these soft sounds. We’ve spent the past half hour driving north along the dirty track which passes for a state highway, and after every half mile he’s been getting out, climbing onto the roof of the pick-up truck, and waving an H-shaped aerial around in the air. “Listen!” he says again, jumping down from the truck and holding the radio receiver near to our heads. And we listen and hear a faint “beep, beep, beep”. While he speaks, our friend has been donning his wellies. We four are already attired in boots and waterproof jackets. “Come!” says the young man. “Let’s go and find her.” And so saying he strides off the edge of the road and into waist deep water. 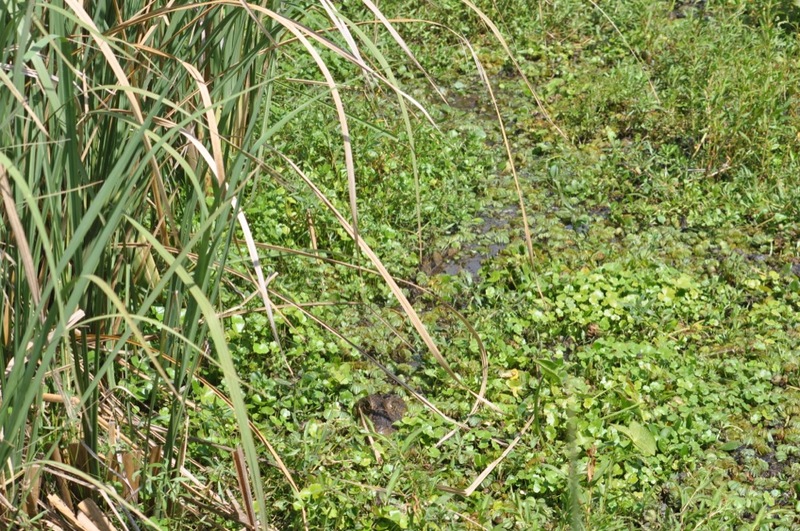 Just like in Orlando FL rat removal is often needed due to the amount of rats, this swamp is home to an abundance of rats and alligators; “And don’t even think about the deadly vipers,” I tell myself as, clutching at the grassy tufts, I pull myself along in Emmanuel’s wake. Each footfall might find the thigh-thick trunk of an anaconda… but it’s best not to consider that danger; it’s best to keep one’s mind in the present moment and forget about fears. Somewhere in this mess of water and mud and tussocks and super-sized voracious mosquitoes lies the thing that we have come all this way to see. 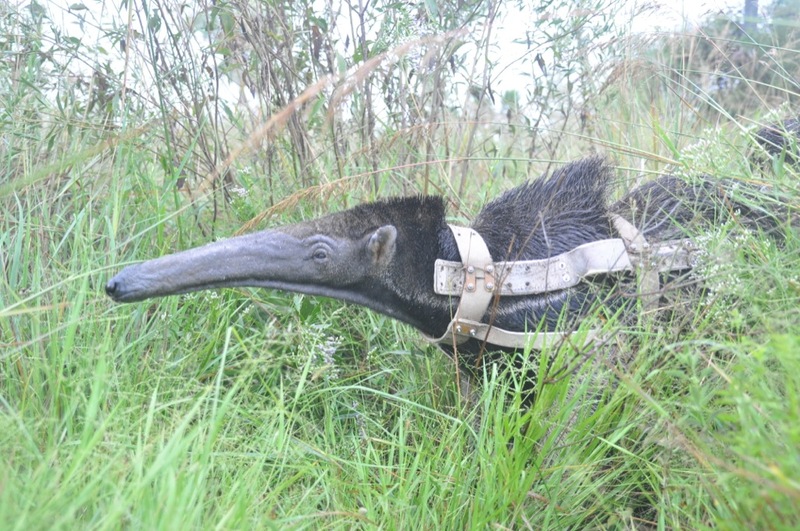 All being well, our reward for enduring such privations will be the privilege of meeting one of the last 5,000 giant anteaters remaining in the Americas. What are a bunch of yotties doing, stalking anteaters? Well, it’s like this: A friend has recently been plastering her facebook page with pictures taken in the Argentine interior – pictures of mountains and guanacos and gauchos, and pictures of swampy wetlands and wonderful wildlife – and those pictures made me think: we’ve been hanging out in South America for all this time, and yet all that we’ve actually seen is the coast. Of course, there’s nothing new about this realisation. Wherever we go, it’s always the same. Travelling on the ocean, like a nautilus drifting along in its shell, we have access to millions of miles of seaside; but seaside is just orange peel. The interior of a country is generally much juicier – much more culturally and scenically distinct – than the part which, for centuries, has faced and embraced the foreign visitor. 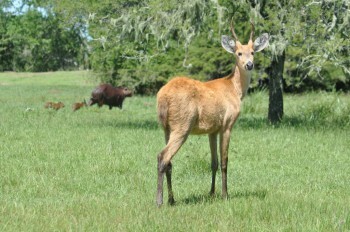 Perusing our friend’s photos I found myself thinking about a safari which we once made while we were in southern Africa. We hired a car and we all piled in, and for a week we were tourists exploring in the conventional manner. We visited Etosha and saw elephants washing each other at a waterhole; we saw ugly hyenas hassling a giraffe; we saw lions stalking zebra, and we saw vultures feasting, the following morning, on the remnants of the lions’ meal. It was 12 years ago that we made this inland foray, and we’re still gloating over the memories. Looking at Sylvina’s pics I decided that we were long overdue for another Big Adventure. And so we bit the bullet – we phoned the bus companies and the car hire people and we found that, where four people are concerned, car travel is cheaper by far – and we made our plans. Argentina is vast. It reaches from the tropics all the way down towards Cape Horn, a range which equates to a country extending from Western Sahara, all the way up through Morocco, Spain, France, and England, to Edinburgh. And it reaches form the Atlantic all the way across to the top of the Andes, only stopping 50 miles short of the Pacific. But the Andes are more easily reached from the Chilean coast than from the River Plate; and we can visit Patagonia when we go south, later this year. In fact, the question of where to go, in this wondrously vast and varied land was actually answered very easily: we would go where we had been invited. Some months ago we were introduced to one Sofia Heinonen. Her brother was already a good friend of ours, and the lady herself is the head of the Argentinian division of the Conservation Land Trust. 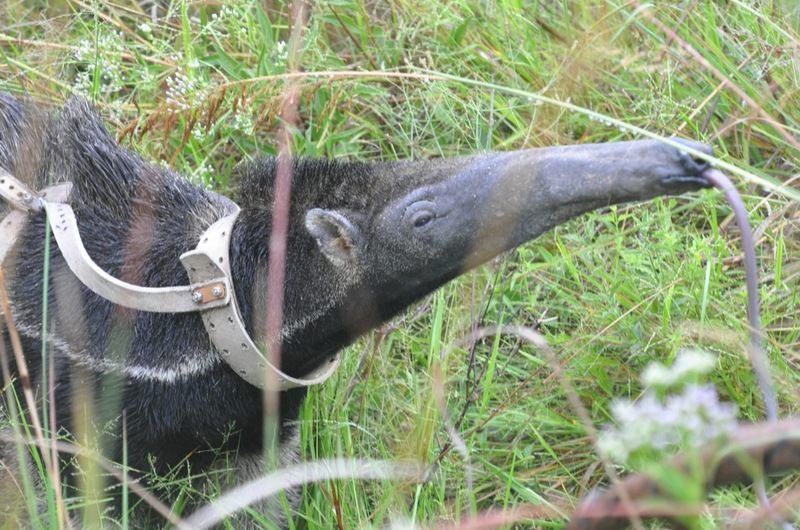 She is also the project manager of a plan to reintroduce anteaters to one of the CLT’s major Argentinian holdings – a huge area of marshland, in the north of the country in the province of Corrientes. On learning that Roxanne is eager to pursue a career in environmental conservation, Sofia invited us to visit her at Esteros del Iberá and stay at her house in the centre of the park. 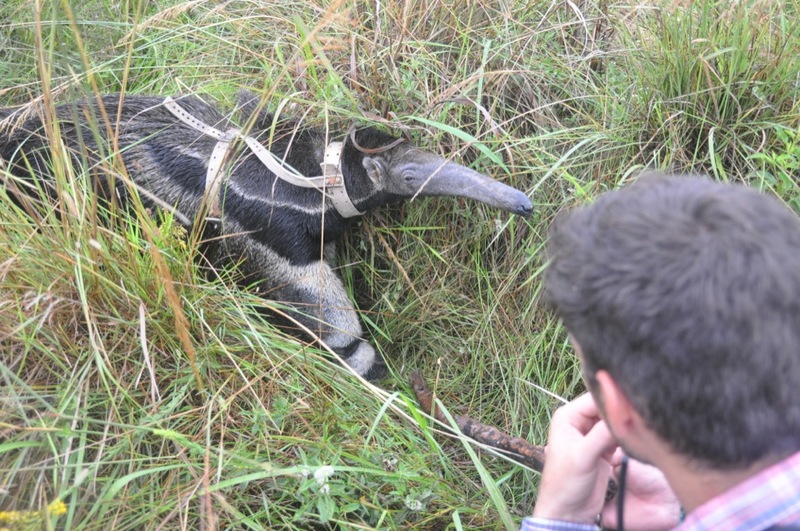 Born in a zoo, this anteater has been sucessfully rehabilitated into the wild. She wears a radio-collar so that the scientists can track her. Before we go any further I ought really to say a few words about the Conservation Land Trust. This wonderful organisation was founded by an American business-man and his business-lady wife. Doug Tompkins was the creator of the North Face outdoor-clothing company and of the Esprit sports’ clothing line, and his wife, Kris, was one of the founders of the Patagonia Clothing Company. On realising that their business commitments were at odds with their environmental concerns and actually supported the consumerism which they sought to eschew, the couple sold their interests and founded a philanthropic trust. Its main objective is salvaging land which is threatened with exploitation and recovering land which has been despoiled by monoculture and other agricultural malpractices. Incredible as it may seem, when one considers the intention underlying his actions, Doug Tompkins has had rather a bad press in Argentina. The first thing anybody ever told us about him was that he owns a huge swathe of land reaching all the way from the Atlantic, across both Argentina and Chile, to the Pacific. This is more or less true – except that Doug doesn’t actually own the land, as such. The trust which he founded and financed buys and owns the land. And the object of the exercise is to revert the land to its natural state and then get it back into public ownership. 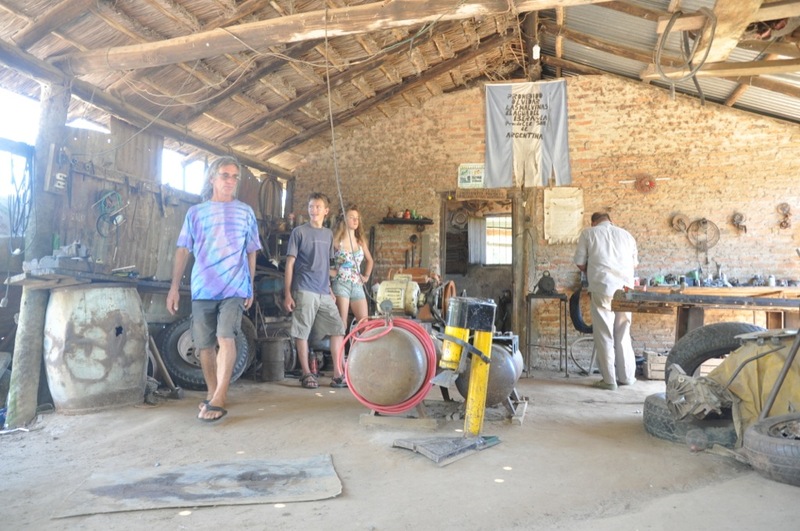 Acting via their trust, the Tompkins have already purchased almost one and a half million acres of land in Chile, have created seven parks and, having resurrected the land, have already donated two 750,000-acre-parks to the nation. Moreover, they’ve already handed over a huge park in Patagonia, ceding the lands to Argentina’s federal government. Not everybody loves Doug Tompkins. 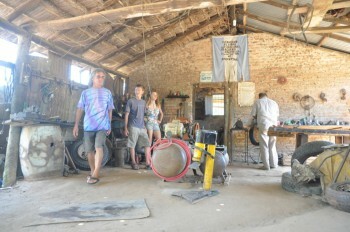 In this mechanics workshop we found a poster proclaiming Ibera to belong to the locals and not to a national park. With a CV of this kind, how could Doug and Kris possibly be ill-received in northern Argentina? Well, the fundamental problem is that not everyone likes the idea of saving the swamps from desecration and preserving the local wildlife. The estancia owners, in particular, would prefer to be allowed to cover the land in cattle and in eucalyptus trees (an exotic species, grown for the paper industry). And the locals don’t like the idea of their lands and waters being ceded to the federal government. Whereas Doug and Kris hold the belief that no one can own land, some of the Corrientinos are narrow-minded and want to keep control of the region. 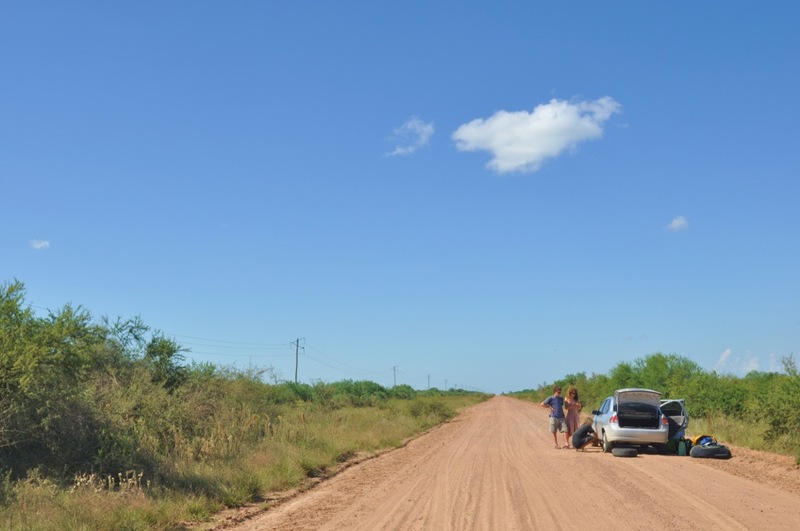 Flat, flat, flat is the Argentine interior – as flat as a gently heaving ocean – with flocks of scrub bushes and islands of fir trees and eucalyptus scattered over the green sea. The sky, too, is big and still and empty. Somehow, it seems like rather a waste of space! Already, after just four hours, the long straight road has hauled us so far into the big continent that I’m feeling uneasy and vaguely claustrophobic, homesick for a glimpse of water. It turns out that the river is not far away; but it took our friends, in their floating home, three months to travel this far. 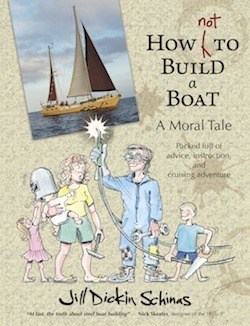 By the time we reach Mercedes, another four hours to the north, we are 400 miles inland – and that’s as far from the sea as any of us has travelled in many a long year, and as far from their element as our sea babies have ever been. Up to this point we’ve been travelling on a motorway, and the only hazards to navigation have been the frequent police check-points and the toll gates, but at Mercedes we set off along a minor road. At first it’s just rather badly surfaced, and we bounce in and out of pot holes, but after 50 kilometres the surface vanishes altogether and we’re travelling along a broad dirt track. According to the locals, the road used to be just fine until the government decided to improve it. First they covered it in stones; then they covered it in a thick layer of earth; and then somebody made off with the rest of the money. When the weather is dry, as it was at the time of our arrival, the road is paved with dust and sharp stones. “When it’s wet,” somebody told us, “then the road is impassable except in a big 4×4.” But we didn’t listen; didn’t want to listen. And anyway, we weren’t planning on wet weather. We trundled along over the stones and got ourselves a puncture. Iberá means Shining Waters, in the local Guarani Indian tongue (i meaning water – as in Iguazú Falls – and berá meaning shining), but the fact is that there’s actually not a lot of open water in this place. Instead, what we find is a huge area of marshland some 300 kilometres long and about 100 kilometres wide. The CLT own various patches of land and swamp fringing this area, and the organisation’s headquarters is sited at the largest of these, in a group of buildings erected in the 1880s by a Finnish immigrant. The ranch which the Finn established continued to operate until the 1990s, when the trust acquired the land, and they’ve retained its name: Rincon del Socorro. Roughly translated, that means Safe Nook. On arriving at the nook we discovered that Sofia was absent. “Make yourselves at home,” she told us, via a text message, “and I’ll join you in a couple of days’ time.” And so we settled ourselves into her spacious red-roofed house. On the morrow, we decided, we would take a walk and see what wildlife we could find – but we didn’t have to wait that long; and, indeed, we didn’t have to go looking. 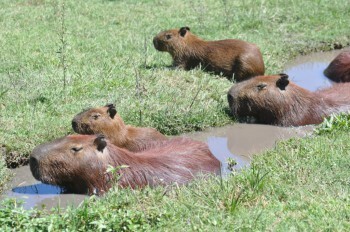 Capybaras love wallowing, but they also whinny rather like horses and bark like dogs. Outside the window a family of capybara ambled by, cropping the lawn with their fat muzzles. Renowned as the world’s biggest rodent, capybara might best be described as sheep-sized guinea-pigs, but they also love wallowing in water and in mud, their coarse reddish brown fur keeping them warm and dry all the while. In effect, they seem to be a sort of a cross between a hippo and a rabbit. They were not at all shy of the new arrivals. 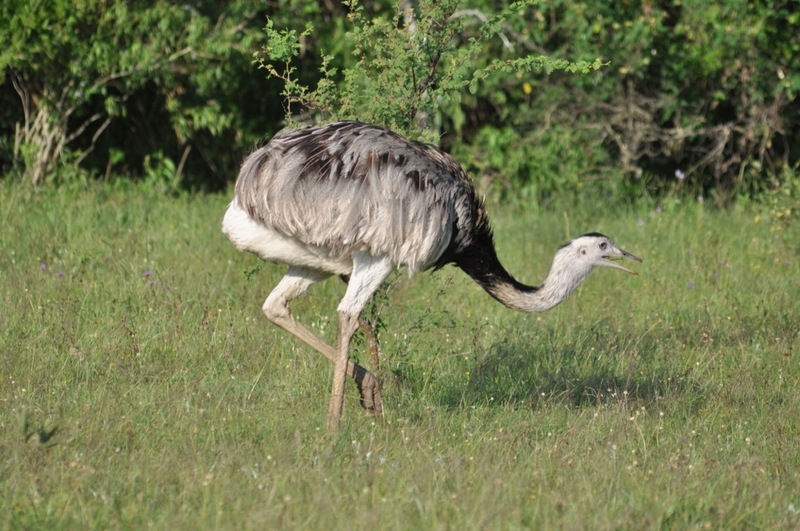 On the other side of the house, another of nature’s weird wonders wandered past: the rhea may not be much when compared to the ostrich, but taken by itself it’s an impressive creature. 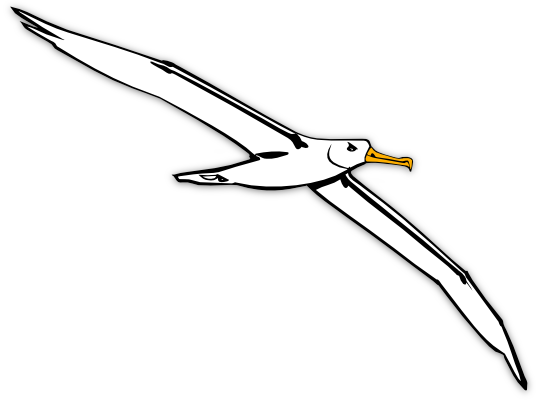 In theory it’s a bird – and, after all it walks on two legs, has a beak, and is clad in feathers – but since it can’t fly, has a neck like a diplodocus, and runs as fast as a horse on thighs like massive chicken drumsticks, the relationship seems moot. For two days after our arrival the weather remained dry and the sun shone upon us. 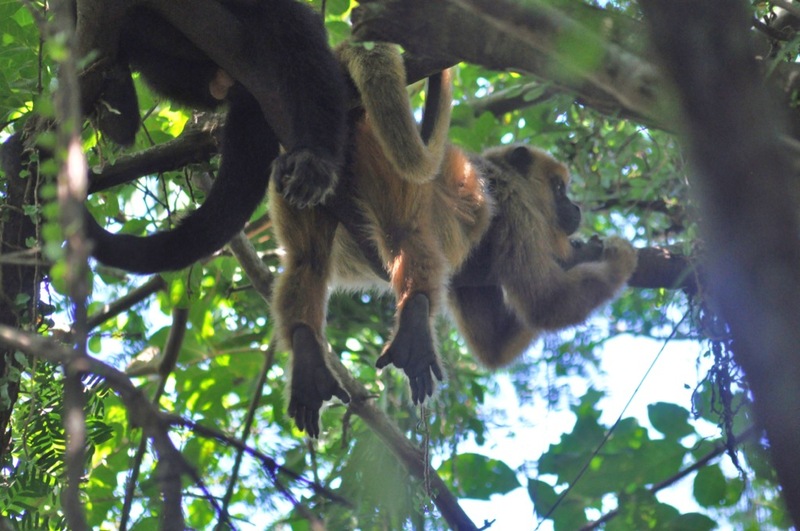 We visited the nearby settlement of Carlos Pellegrini – a one horse town with three gomerias, or puncture repair men – and saw howler monkeys lazing in the branches of a big fruit tree. When I tried to persuade them to jump about, one animal opened an eye and peered at me; the rest were unmoved by my clapping. 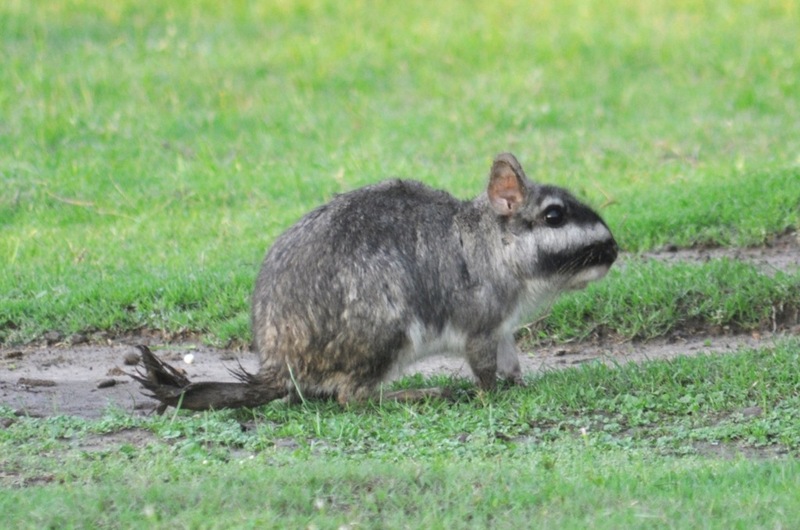 A cute cuddly toy known as a viscacha. 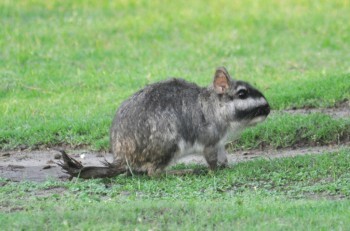 They are a bigger than a big rabbit but like the rabbit they live in communal burrows. On the following day we set out to walk to “the lagoon”, as the locals termed it. A red clay track meandered amongst green bushes – past capybara and rheas, past woody-woodpeckers tapping on palm trees, and past a huge wild boar who hurtled off into the bushes. The boar was the only animal who displayed seemingly undue fear of the intruders – and he, as it turns out, had good reason: as a non-indigenous species this animal is not welcome on CLT land and efforts are being made to remove it entirely, by hunting it to local extinction. 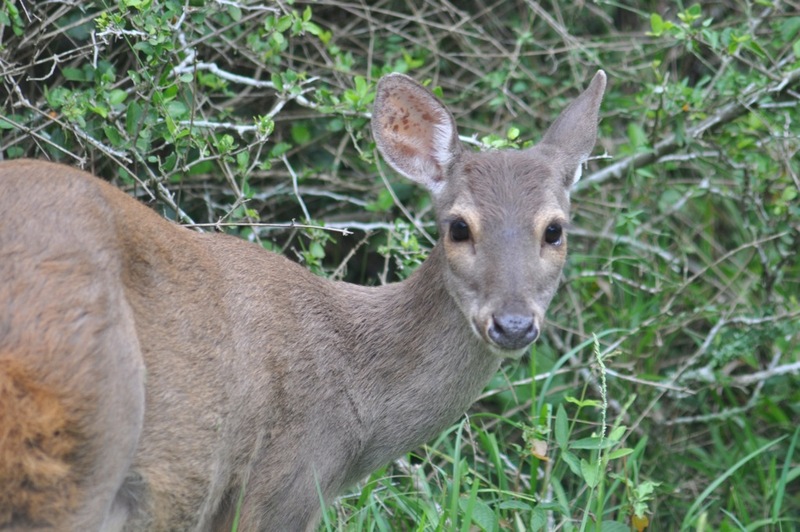 As we walked, we came upon little brocket deer and big, beautiful marsh deer, the former quite common, the latter a threatened species, forced to the brink of extinction by habitat destruction. 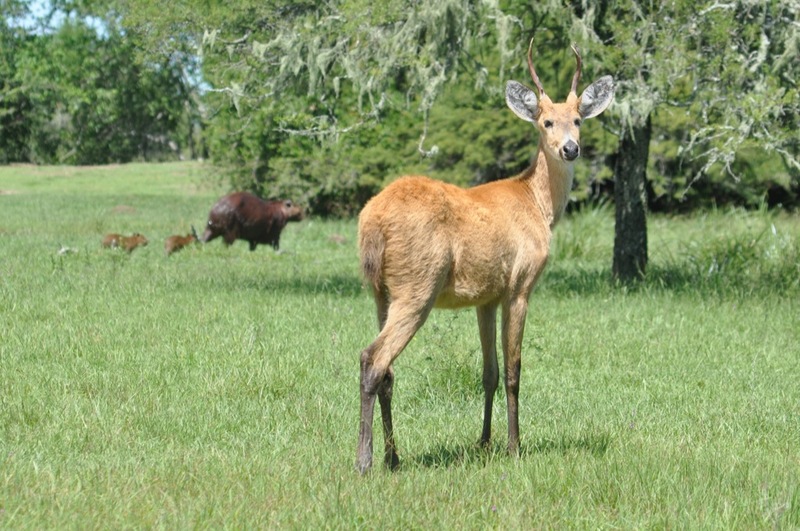 Whereas deer in an English woodland would have fled at the sight of us, their Argentinian cousins merely kept us in view and continued to browse. Scuttling about on the track were numerous tarantulas, this being the season when the males set out to find and mate with the females, and it was while we were crouched on the ground examining one of these creatures that we saw our first fox. Actually, it was the fox who saw us first, and we, being engrossed in examining the spider, didn’t see him until he was standing just behind us. From the way he was acting it seemed that he thought we had found something good to eat and was hoping to get a share! Our first little grey fox. He was watching to see what we bipeds had found on the path. 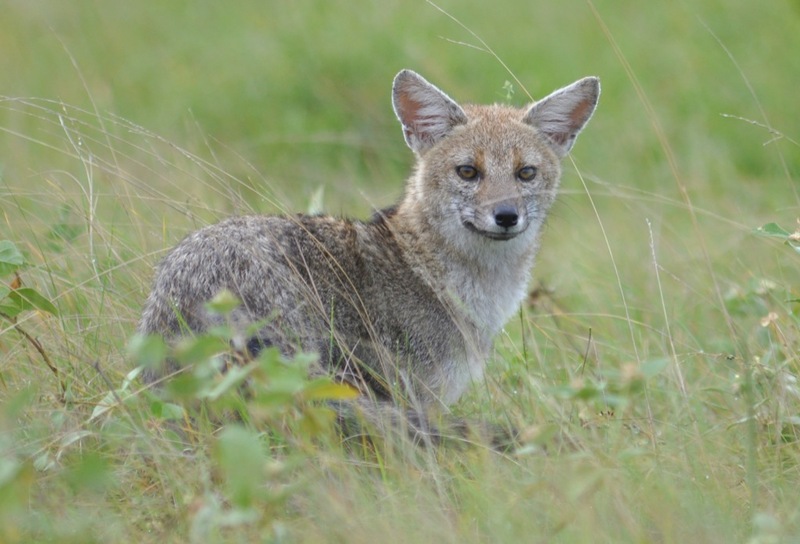 City foxes in England are also pretty cool – they will wander along the pavement scarcely a hundred feet astern of a man – but foxes in the countryside are so wary that one seldom sees more than a glimpse of the animal as he vanishes into the bushes. Thus, we were thrilled with this encounter. 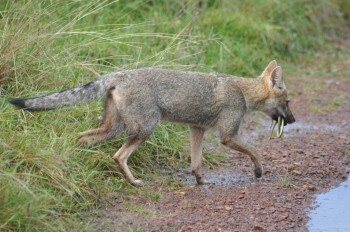 We were still marvelling when, some minutes later, another fox appeared ahead of us carrying a dead snake in its mouth. Slightly unnerved by the fact that we all stopped to stare at him, this one left the track fifty feet ahead, made a detour through the long grass, and joined it again in our wake. Such, it seems, is the behaviour of animals who have never known man well enough to view him as a threat. 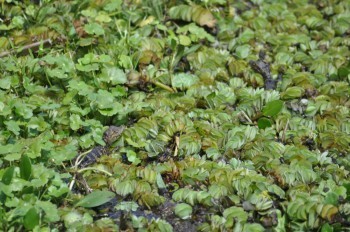 When, finally, we reached it, the lagoon was something of an anti-climax being entirely camouflaged by floating weeds. But the marsh deer wandering about its edges were a sight worth seeing, and on the way home we encountered various birds of prey and came upon two burrowing owls who were sitting outside their den. Back at base, we whinged a bit about the lack of water, or evident water, in the alleged lagoon. 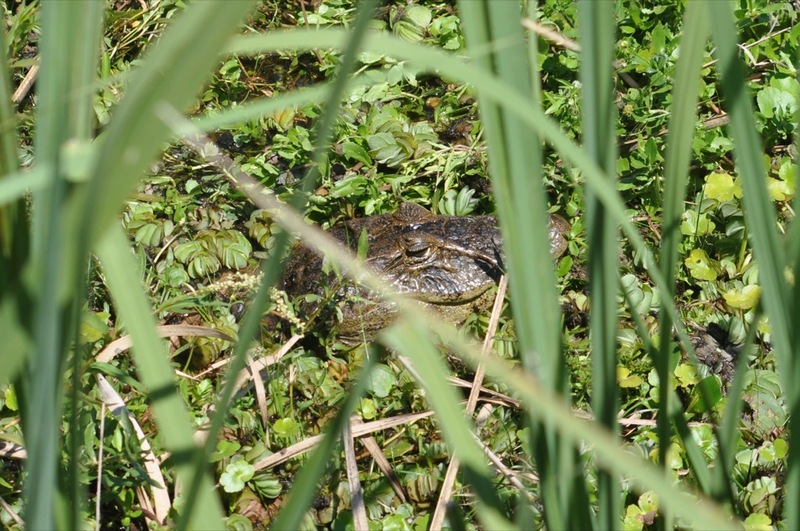 “I was hoping to see an alligator,” said I. “Oh, they’re everywhere,” one of the wardens replied. “Look in the pond,” he said, waving an arm in the direction of a swampy creek, some two hundred yards away, where the capybaras were wont to wallow. 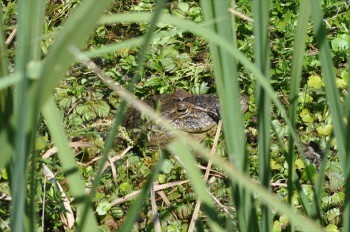 We’d already wandered along the edge of the swamp and had seen a huge lizard, with a head like a snake. At our approach it went skittering off over the pond-lilies with every toe outstretched. Hoping to encounter the lizard for a second time we went for another stroll and were blundering along, chatting about this and that, when a ruddy great crocodile got up from the grass just ahead – just where the lizard had lain, in fact – and hurried towards the water. There it waited a while, smiling a toothy grin and keeping its big eyes fixed on me. 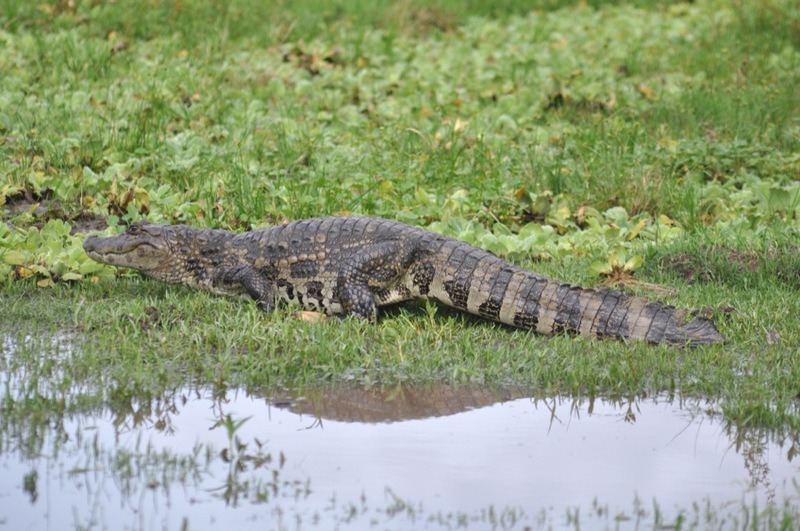 The South American reptile is more properly known as a caiman, and unlike its African cousin it isn’t a man-eater; its favourite food is fish. 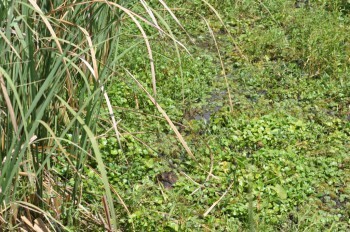 Even the capybaras were not so afraid of the scaly monster as they might have been. Two big males who had been chasing each other around for the past hour came to a grinding halt at the creature’s nose, but having looked it in the eye the leading capybara leapt confidently into the pond and swam past hardly a capybara’s length from the intimidating jaws. 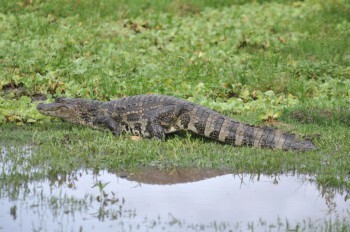 His pal (or hated enemy, perhaps) made a rush at the caiman, and the beast shot into the water. He spent the next hour pretending to be a piece of pond weed, doubtless hoping all the while that a moorhen or a baby capybara would happen to pass nearby. 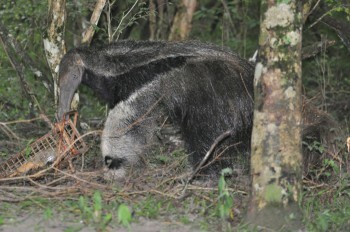 On the next day it rained, and it was on the one after that that we went with the warden in search of giant anteaters. As has been mentioned, the CLT’s aim is to restore land to its natural state, and that includes repopulating it with whatever fauna might rightly belong to the local ecosystem. 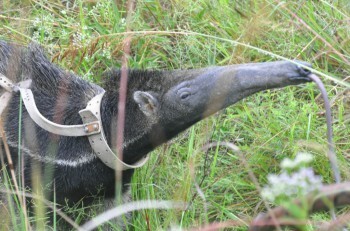 Anteaters had been extinct in the province of Corrientes for several decades, and so the trust decided to embark on an ambitious project of reintroduction. They acquired two animals – one born in captivity in a zoo and the other kept since infancy as a pet – and they transferred them to large pens. The pens contained ants’ nests, and in due course the animals learnt to open them up and feed, in the way that wild anteaters do, from this source. Eventually their carers decided that the anteaters were ready to be released into the wild, but before they went they were fitted with radios. 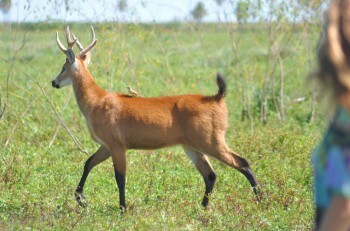 Only by this means could the scientists be sure that the animals were still alive and well, and only by tracking them regularly would they know if the project had succeeded to the extent of their dreams: to the extent where the captive-bred animals had mated and bred and successfully raised young. 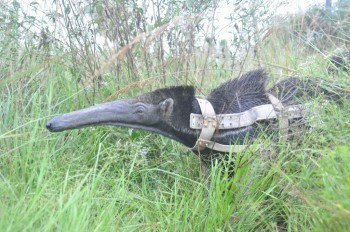 Tota, a 12 year old anteater, wearing a radio harness. Tota is reckoned to be 12 years old, and she’s been roaming around in the wild for 6 years now, mating annually and producing one offspring every year. 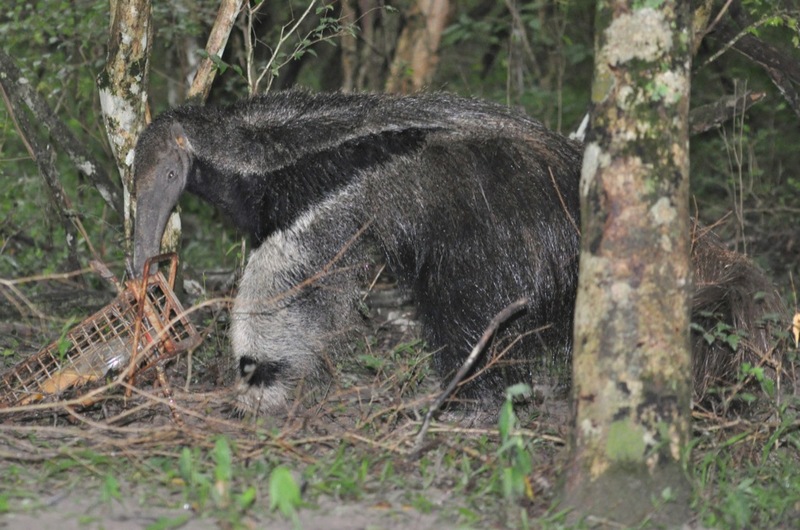 Whereas most anteaters prefer dry habitat she has set up home in a swampy area of the wetlands, but when we found her – having hauled ourselves through half a mile of bog – she seemed to have been taking a nap under a scrub bush. Unfazed by the appearance of five bipeds, she blinked and uncurled her long string-like tongue. What an extraordinary animal is this! Its body is that of an oversized badger, but its tail is so big that it can use it as a blanket. In fact, the overall impression is of a large dog wearing a very hairy carpet. Meanwhile, at the other end, above a pair of wonderfully furry striped trousers, the anteater has a ridiculously long, soft-seeming muzzle topped off by a dog’s black nose. Tota blinked at my camera and slowly lifted one front paw. “She’s going to attack you,” said Emmanuel, gently pushing the foot back down to the ground with a stick. On the afternoon of our visit to Tota, Emmanuel asked us if we would like to take a look at one of the cameras. 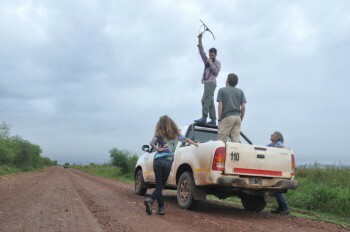 Well… cameras are really not that exciting… but we reckoned that we might meet some more wildlife on the way. And we did; we saw deer and foxes and our very first armadillo, dilloing in his armour. However, that encounter was far from being the most exciting one of this little expedition. After we had walked for an hour or so, along a muddy track, Emmanuel led the way into a small copse. Just before we arrived at the place where the camera had been installed we came to a ditch and a stream. In order to cross the stream we needed to swing from a rotten branch, and with my Nikon hanging around my neck I was not too keen on this activity. Well, I’d been waiting for all of 60 seconds when along through the woods came – would you believe it? – a big, black and white anteater! And this one had no harness to spoil his good looks. “WHAT? WHERE?” Emmanuel leapt to his feet and spun around. “Run!” he cried, as the animal rushed towards them. And from my position in the stalls I watched with great amusement as the four of them dodged behind trees and scurried towards the ditch, pursued by a black and white hearth rug..
After a while the anteater grew bored of trying to greet his old friend – that, in any case, is what he seemed to me to be trying to do – and he turned his attention to the bottle full of food. Poti came originally from a zoo. The zoo’s other anteater killed their keeper. Well, according to what we have heard, permission may be only days away. Everybody has to eat. This fox has found and killed a snake and is taking it home to her cubs. Sofia never did made it back to Iberá during our stay. She was busy in Buenos Aires, meeting government ministers and getting the necessary signatures to give her the go ahead. Meanwhile, we watched the wildlife wandering around her house on the close-cropped grass. A few jaguars would certainly put the wind up the capybara and the rheas… and is it really desirable that they be harassed, and their attitude changed from complacent to perpetually fearful? Well, according to Doug Tompkins, it is. Doug is also the co-founder of The Foundation for Deep Ecology, and according to the ideals of this institution the top predators are just as important as the ones which support the pyramid. Remove the sea otters and what do you get? You get an abundance of sea urchins which destroy the kelp forests, leading to the local extinction of animals which depended on that environment. 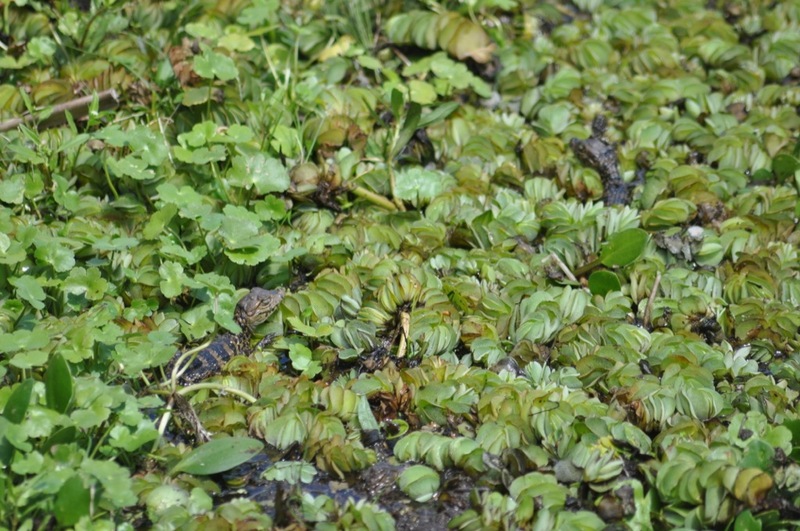 Likewise, if you remove the jags you get a glut of capybaras, and this leads to the destruction of large areas of plant life and, subsequently, to the loss of insects and birds depending on those plants. And so on, down the line. We marvelled at the half-tame animals. As dusk fell the parakeets came home to their big communal nest, just outside the door and quarrelled noisily as they settled down for the night. 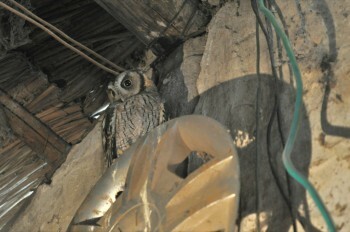 A yellow and black woodpecker spent each night roosting under the huge eaves, above the front door. 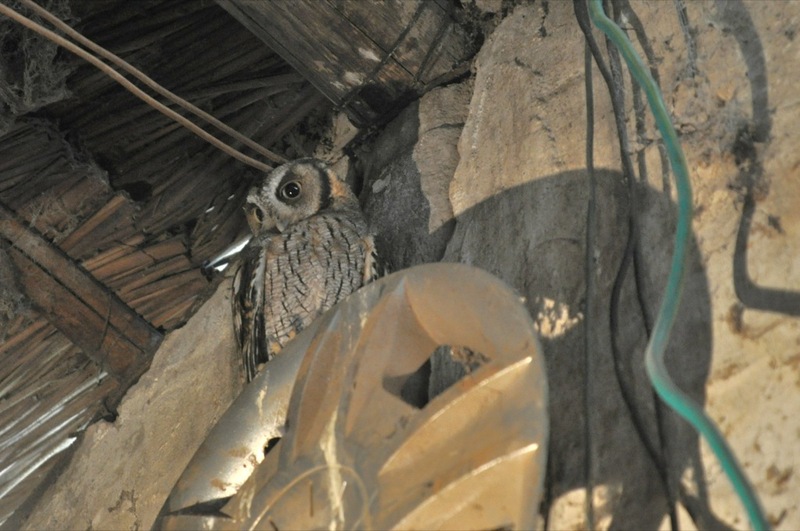 Meanwhile, screech owls were leaving their perches under other eaves and setting out on their nocturnal business. Foxes grew bolder even than they had been in the light of day and took a short cut across the veranda. And all of these creatures have to eat. 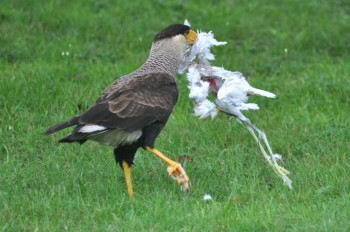 One afternoon we were watching a pair of caracara poking around on the lawn. These big raptors prefer to eat chunks of red meat, but they lack the eagle’s ability to soar or the peregrine’s skill at aerobatics and so their diet normally consists of roadkill and other carcasses. When they can’t find a nice chunk of squashed capybara they have to resort to eating creepy-crawlies, and thus, for the past few days these two had been quartering the short, sodden grass. The rain had seemed to spawn an abundance of frogs – all night we heard them whistling to one another just outside the window – and the caracaras were not the only ones taking advantage of this plenty. Near to them walked a little white egret. Too near, in fact. One moment he was snacking, and in the next he was a snack. Engrossed in his own nourishment, the little white heron was a hunter; but a moment later he was the hunted one. It all happened so very fast. In one instant the killer had his beak around the throat of a flapping wriggling white thing, and in the next he was tearing out its heart and lungs and gulping them down. Within three minutes there was nothing but white feathers, scattered like petals on the green sward; just perfect white feathers and a long pair of legs and a beak, and the murderer flew away with these last remnants dangling from his gape. That’s life as Nature would have it lived: solid and real, and reaching ahead for as far as the eye can see; and then gone in an instant. Snuffed out; finished. And the raw materials begin another round; another dance. Doug Tompkins would have approved. Early the next morning, before the sun was awake, we met a little skunk and followed him into the schoolroom. Sofia later told us that she once found one in her refrigerator. It had come in through the open front door of the house and had managed to open the door of the fridge. It had eaten the butter and eggs and bitten into two boxes of milk, making a glorious mess, but now it was cold and was very pleased to be let out. Well, we knew that because Roxanne had been furtively feeding them cheese sandwiches from her hands. Mind you, if we’d known that they would come inside the house… and not only them but the armadillos, too! “if we’d known we would have left the door open!” I said. There’s only one problem with Esteros del Iberá, and that’s getting there; or, in our case, getting away again. The road which once had been dusty was now a quagmire, and although we waited two days for things to get better they got worse. Finally, we could wait no longer – the car hire company wanted their vehicle back – and so we embarked. The photos tell the tale better than words could. After we got bogged down a passing estancia owner very kindly gave us a tow – at 40 kilometres per hour, with both of us sliding sideways at times. Worse things happen at sea, much worse things – but it turns out that cars aren’t as rugged as boats. Or at any rate, the Chevrolet Classic, with only a hand’s span road clearance, is not the car to choose for rally driving. The fun ride cost us a new fan belt, another puncture, and a new clutch. In closing I should like to thank the people of the little town of Mercedes for their amazing hospitality. The first one that we met cast her eyes over our mud-caked car and said, “Come and borrow my hose.” And while we were washing the car (and destroying her lawn) she cooked us a delicious meal! Thank-you, Rosita! As for the chap who mended the machine – Eduardo couldn’t get the job dome that same evening, and so, when we told him that we couldn’t afford a hotel he agreed to let us sleep in his garage, in the car. Off he went – but ten minutes later he was back, with his wife. “I’m sorry,” she said, “but I can’t let you sleep in the garage. You must come and sleep in our house”! And so we passed a pleasant evening and a comfortable night on camp beds and lilos. If anybody happens to be passing through Mercedes and needs a mechanic, contact Eduardo at El Yacarecito. 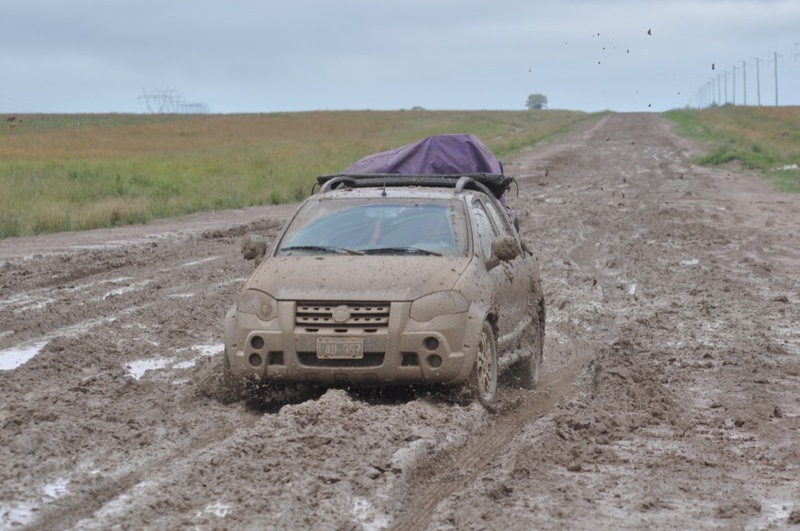 And, of course, our thanks also go to Juan and Juan Augustin, the guys who towed us for 50 kilometres through that slurry. Finally, we would like to thank Sofia for lending us her house, Emmanuel for taking us to see the anteaters, and Doug Tompkins for founding the reserve. One hears so much bad stuff about capitalist tycoons and the damage that they, through their greed, are doing to the planet. Here we see the other side of the coin. With enough right-minded rich men willing to invest their earnings in saving and revitalising the planet there is hope for the future. Without a doubt, the best place to stay on the eastern side of the lagoon is at the CLT’s own headquarters. Accommodation here takes the form of a small hotel, or hosteria, crafted from one of the old estancia buildings. 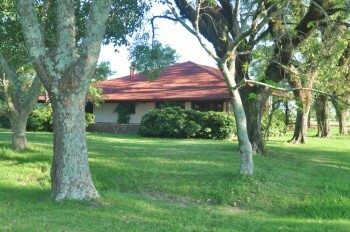 Hosteria Rincon del Socorro boasts just nine rooms, some within the main building and others in separate bungalows. Each one is furnished in a unique style. Prices start at $180 US per night for a double room, but for $280 US you also get full board and the services of a nature guide who will organise wildlife walks and night excursions. Popular activities include horseback riding, for the hotel manager, Leslie Cook, is a one-time trainer of polo ponies. He also used to organise horseback tours in Patagonia. If such stylish living is beyond your means a next-best solution would be to stay at Pelegrino. Here one finds several hotels and lodges of various sorts and there is also a campsite. Just in case you’re wondering how, with out commitment to clean, green living, the Mollymawks can justify this sudden use of many litres of fuel and the consequent creation of carbon gases – we’re doing our best to offset the damage with a donation to Trees for the Future. Each seedling tree costs only 10 cents, and for 100 dollars we can plant an entire forest garden which will help to clean the air whilst simultaneously providing a living for an African or Indonesian family.